You can reach thousands of communication professions with the Job of the Week newsletter and www.nedsjotw.com. Place your job listing at the top. Contact Ned at lundquist989@cs.com and reach out today! Today is Labor Day in the United States. What does that mean to you? Send you your thoughts on work, working, or whatever you think about today as Labor Day to Ned at lundquist989@cs.com. Please note that Ned cannot pay you for your labor in preparing and submitting your response. *** Welcome to the JOTW network. This issue of the JOTW newsletter comes to you from the JOTW World Command Center in Springfield, Virginia, USA. *** The Top Job of the Week! You are among 11,519 subscribers in this community of communicators. Top Job of the Week! 22.) Publicist, San Francisco State University, San Francisco, CA. 25.) Communications Manager, NAHB Remodelers, Washington, DC. I’m writing to ask your favorable consideration to please mention, list and/or post online in JOTW (and any other PR-targeted publications that you put out) the following info about the PRSA Technology Section’s upcoming annual T3PR Technology Section Conference which will be held in New York City on Friday, September 16 at the Microsoft Corporation offices in Manhattan. Please note that this message contains a special discounted admission rate for any of your readers who wish to attend. As part of the annual awards luncheon program, cash honoraria and trophy prizes will be presented to this year’s winners of the PRSA Technology Section’s “Excellence in Technology Journalism Awards” in both the general/business and trade/technical/professional publication categories. Award sponsors for this year are Microsoft Corporation, Airfoil PR and Padilla Speer Beardsley. As a special inducement for readers of your online newsletters, the PRSA Technology Section is offering admission to the all-day seminar at the special discounted low professional rate also offered to Tech Section members. This represents a $160.00 savings for non-members responding to this offer, as well as a complimentary membership in PRSA’s Technology Section for the balance of this year, representing an additional savings of $60. We appreciate your cooperation in bringing this to your readers early attention. Because of customer demand for premium placement in JOTW (yes, really, there is demand from a customer), the JOTW is going to offer a new service called “Top Five Placement.” In addition to special “Can’t Wait” immediate blast announcements, JOTW will also offer to post your position in the top five jobs listed in the weekly newsletter for just $100. Here’s the latest from Tom Clementson in Afghanistan. Ned—thought you would get a kick out of this as it goes beyond simple photos. Pushed it through HootSuite on a couple of other channels. We'd like to take advantage of your “Top 5” listing in hopes of grabbing the attention of your loyal JOTW community. We have an immediate opening in our northern Baltimore office for a VP of our Healthcare business unit. We're an 81-person integrated communications firm representing global brands. The vice president will direct account teams in the planning, recommending and implementing of proactive and strategic communications initiatives for agency healthcare clients. Working with the agency president, the position is responsible for the overall profitability of the business unit, driving revenue growth and working with existing clients to develop organic growth opportunities for the agency. The vice president is also responsible for the professional development and management of the account teams. A regional Experiential Marketing & Strategic Events Agency is looking for Masochistic, Ambitious and Dynamic individuals, with a penchant for hard work and long hours in a high stress (high reward) environment, to join our zany but fun team. • You would assist in arrangement of all vendors and ensuring that everything moves smoothly when the crazy project day arrives! • A chameleon who’d be able to handle serious clients and let down their hair with the casual ones. • Got experience? Is it more than 2-3 years in event, below-the-line marketing, activation and/or conference management? Was it in a managerial or senior account executive position? • You gotta be cool, charming, creative, fantastic, communicative, highly responsible, have an incredible eye for details, full of ideas and above all, a perfectionist! Conover + Company Communications, Inc.
Conover + Company Communications, Inc. has an immediate opening for an Public Relations Coordinator in its Westborough, Massachusetts office. The Public Relations Coordinator is an entry-level position that provides an opportunity for a talented, hard working individual to learn all aspects of public relations and strategic communications while working in a support role with agency principals and senior consultants. The Public Relations Coordinator must be a highly motivated, highly organized team player who has the ability to work effectively on a number of time sensitive assignments. The role requires a strong degree of multitasking, time management, and a sharp focus for details. Exemplary communication (written and verbal) skills, flexibility, and a sense of humor are essential. The Public Relations Coordinator is expected to have a passion for our industry and for mastering the basics of PR and a “can-do” attitude. This position is designed to prepare the individual for increased responsibility and career advancement within the agency. Perform essential account support duties such as activity tracking, report management, maintaining account files, updating lists, media clip files and books, mailings, data entry, etc. Conover + Company’s team of experts has decades of experience—and a strong track record of success—providing strategic communication services and leading campaigns that raise awareness, protect and build reputations, address important issues, and advance business interests. Our team members have worked with a wide range of federal, state, and municipal government agencies, public and private corporations, NGOs, and academic institutions in more than 50 countries. We work with clients to inspire and articulate new ways of thinking and to build trust, collaboration and alignment across internal and external stakeholders. We are committed to working with clients who share our belief that integrating social responsibility into business goals and operations has the power to build better lives and affect positive change. For consideration, please submit resume along with a brief email summary of qualifications to kgould@conoverandcompany.com. Ned, thanks in advance for sharing the below career opportunity with your subscribers. Here's an opportunity to become a part of, and help shape the culture for, a new $3.7 billion division of one of the world's largest companies. GE Energy has an immediate leadership opening for an experienced, talented and creative internal communications manager. Supporting the executive leadership team and cross-functional business units, this is a highly visible role with a global reach, impact and influence on an international workforce located in over 60 countries. The position is based outside of Hartford, CT and includes full relocation if needed. A comprehensive job description is detailed in the below link. If interested or you know someone that might be a good fit, please apply via the link. To assist the Chief Innovation Officer in the creation and implementation of a strategic, multi-faceted communications program designed to build and strengthen the organization's messages to key stakeholders and reinforce its role as a leading provider of healthcare both in the region and nationally. To devise program guidelines and policies, oversee implementation processes, and oversee the delivery of communications programs of the highest quality. Bachelors Degree. Advanced Degree in Communications, Public Relations, or Journalism. 7+ years of Public or Media Relations, Communications, Journalism Experience. Proven experience communicating in health, medical and/or association arenas. Experience working in a Public Relations Firm environment. There's a publicist position now open at San Francisco State University. The person hired will be expected to take the lead on social media tactics for the department as well as do more traditional activities, such as writing press releases and stories, promoting individual faculty as experts and responding to requests from reporters. We are looking for a team player who writes well and can handle a broad range of subject matter. Thank you for posting the job announcement. NAHB Remodelers (www.nahb.org/remodelers) is America’s home for professional remodelers, representing the more than 11,000 remodeling industry members of the National Association of Home Builders (NAHB). NAHBR provides information, education and designation programs to improve the business and construction expertise of its members and to enhance the professional image of the industry. Its membership incorporates 148 local councils in 45 states. The position is located in Washington, DC. Description: The Communications Manager provides communication planning, editorial, and writing support for NAHB Remodelers. Raises awareness of NAHB Remodelers and professional remodeling within NAHB, the building industry and the consumer marketplace through a combination of communication, public relations, and marketing efforts. Manages NAHB Remodelers member electronic and print communication products and social media, providing timely information to members on the council and the remodeling industry. Works directly with members through committee support to develop communication strategies. Experience: Minimum four years communication, writing, editing and public relations experience. Must be Internet savvy with background in developing content for websites, Twitter, LinkedIn and other online communications tools. To Apply: Interested individuals are invited to send resumes and cover letters with minimum salary requirements to remodel@nahb.org. Please include “NAHBR Communications Manager” in the subject line of your email. Please let me know if you need anything else. Thanks very much for your assistance. DIRECTOR OF PUBLIC AFFAIRS: NEW YORK, NY. The American Psychoanalytic Association (APsaA), the oldest national psychoanalytic organization in the nation, was founded in 1911. APsaA, as a professional organization for psychoanalysts, focuses on education, research and membership development. In addition to the national organization’s membership of 3,400, the organization also includes 29 accredited training institutes and 42 affiliate societies throughout the United States. APsaA is seeking an experienced, team-oriented Director of Public Affairs. The overall responsibility for the Director of Public Affairs is to develop and implement communications programs that effectively describe and promote psychoanalysis, APsaA, and its members. The Director of Public Affairs is responsible for three major functional areas/projects: general marketing and communications for the Association; all media relations for the Association; and strategizing, developing, and implementing both external and internal public relations programs and communications (including graphics communications) that enhance the visibility and promote the value of psychoanalysis. A complete Position Description is available at www.apsa.org/DirPublicAffairs. Please send a letter of interest, salary requirements, and resume to dirpubaffairs@gmail.com. The American Psychoanalytic Association is an equal opportunity employer. To learn more about the organization, visit www.apsa.org. Can you please post the following for your members? Thanks. •	60%: CEO and Executive Communications. With Director, research and write executive communications including speeches, articles, letters, and presentations. CEO delivers 50+ speeches/year. •	35%: Corporate and business unit communications. Work directly with senior leaders on communications for their business unit. Learn the competitive environment for each, and develop deep understanding of their business. Develop corporate communications (internal and external) strategies, plans and messages. Create specific communications as assi gned, such as quarterly releases, collateral, presentations, etc. Lead communications for projects as assigned, such as a recall response, annual meeting, etc. Do you see yourself as a Content Manager? What's your passion? Whether you're into tennis, shopping or karaoke, at IHG we're interested in YOU. At IHG we employ people who apply the same amount of care and passion to their jobs as they do their hobbies – people who put our guests at the heart of everything they do. And we're looking for more people like this to join our friendly and professional team. IHG global headquarters is situated in Denham, Buckinghamshire. It is just a 25 minute train ride from London and close to major motorway networks. The modern purpose designed offices allow us to showcase our 7 brands to corporate employees and visitors. Facilities include, state of the art meeting space, restaurant and café, Gym, exercise studio and marketing suite. Approximately 400 employees based at head office support the Europe, Middle East and Africa region as well as global teams. Responsible for business partner relationship, management of regional content team members, project prioritization and overall web content strategy within the company's global intranet, including various views or sites that may be utilised by subsets of the user base. This includes working directly with business partners and users to ascertain the business' needs and requirements, analyzing and providing alternatives to meet those needs, then designing and implementing solutions to those needs. Collaborates with senior leadership to understand needs, implement content publishing guidelines and standards, implement educational and training solutions for content authors and publishers, and manage effective search tools. •Work directly with business partners to design, develop, document, and maintain sections and sub-sections of the company's global intranet. Provide technical consultation in major content and community development activities, including page layout, navigation hierarchies, graphic image design and production, and portlet design. •Act as an ambassador of the product and team to both business colleagues and vendors. •Manage content team and ensure implementation of global site design guidelines and taxonomy. •Work with publishers to implement and enforce content management governance policies and procedures, including security. Periodically perform audits of published content to ensure adherence to guidelines. •Manage and monitor search and search results, recommending and implementing improvements. •Develop and train content authors and publishers, both internally and externally. •Liaise with product support teams. Act as 'tier 3' support for escalated issues. Work with product and vendor development to resolve any issues. •Provide reports to management on a regular and timely basis. Monitor and report on site performance and usage. •Regularly solicit feedback from the user base. Compile and report on suggested improvements, suggestions, and issues. Bachelor's Degree in IT, E-Business, or a relevant field of work or any equivalent combination of education and work-related experience. •Experience in managing web content and team along with user interface design with demonstrated technical proficiency related to the position. •Demonstrated understanding of the Internet, browsers, search engines, content management systems, servers, and Intranets. •Demonstrated ability to design and manage digital assets (such as images). •Demonstrated ability to design effective and engaging web pages. •Demonstrates effective verbal and written communications skills, including adapting communication to the needs and level of the user. •Ability to work in a fast-paced, dynamic environment with constantly-changing priorities. •Applied organizational and time-management skills. •Ability to establish and maintain a high level of customer trust and confidence. •Proven ability to work with business customers at all levels to develop creative, effective, and appealing solutions to business needs. You must meet the legal requirements to work in this country. Hotel discounts worldwide are available as well as access to a wide variety of discount schemes and the chance to work with a great team of people. Most importantly, we'll give you the room to be yourself. IHG is an international hotel company whose goal is to create Great Hotels Guests Love. We have more guest rooms than any other hotel company in the world – that's rooms in over 4,100 hotels across nearly 100 countries. Our guests make over 160 million stays in IHG hotels every year. We operate seven hotel brands – InterContinental, Crowne Plaza, Hotel Indigo, Holiday Inn, Holiday Inn Express, Staybridge Suites and Candlewood Suites. Big fan of your site. We have an opening at the trade association I work at, and I was hoping you might be able to add the following listing to your site. Let me know if you need any other information from me. Big thanks in advance! If you’re an enterprising writer/editor with a flair for business journalism, this is the job for you. The Independent Insurance Agents & Brokers of America, Inc., one of the largest small business associations in the country, is looking for a motivated writer/editor to join its communications staff. Join a fast-paced communications group that produces a monthly magazine (Independent Agent), weekly email newsletter (Insurance News & Views), websites and social media content for a trade audience. The online editor spearheads content development for the weekly email publication (circulation of 90,000) and magazine website, which recently underwent a complete design overhaul. Duties include: story generation, reporting, writing and editing. The ideal candidate will be a self-starter, have an undergraduate degree in journalism (or a related field) and 1-3 years of business, trade, association or other relevant reporting/editing experience. Strong reporting, writing and copyediting skills and command of AP style are required. To apply, please send a cover letter, resume and three clips to Diane Rusignola, managing editor, at diane.rusignola@iiaba.net with the subject line “Online Editor.” No phone calls, please. This email is going out to friends, students, faculty and previous applicants for some of our co-op positions last spring. We have new student jobs opening this fall I wanted to let you know about. The positions are tilted a bit more towards the writing and social media end of the spectrum, though this would be an excellent fit for a writer who wanted to explore web and multimedia production or a producer who wanted to focus on their writing skills. The positions are open to both graduate and undergraduate students. Appreciate you passing this info to some of your great contacts and students. NASA invites students working towards degrees in journalism, communications, media relations, science writing, interactive journalism, or broadcast journalism, to participate in our science storytelling program – before you graduate. The Pitch: You’ll gain on the job experience as you work with a leading team of writers and multimedia producers to create and share content from some of NASA’s most exciting missions: mind-blowing results from the Hubble Space Telescope; breaking solar storm imagery and the emerging field of space weather; new views of the moon from the Lunar Reconnaissance Orbiter; and major stories on our changing planet from NASA’s Earth observing fleet of satellites. Students wishing to explore the intersection between print/broadcast journalism and social media environments are particularly encouraged to apply. Duties: Writing, editing, pitching, recording, creating, crunching, captioning, surfing, shooting, feeding, porting, posting, designing, updating, networking, texting, tweeting, playing, mashing, and exploring. You’ll collaborate on sophisticated communications campaigns and work on web features, press releases, newsletter articles, press conferences, media interviews, tweet ups, satellite media tours, and video news releases. Required: Program is open to both graduate and undergraduate students in matriculated academic programs. Excellent writing skills and personal participation in social media communities required. 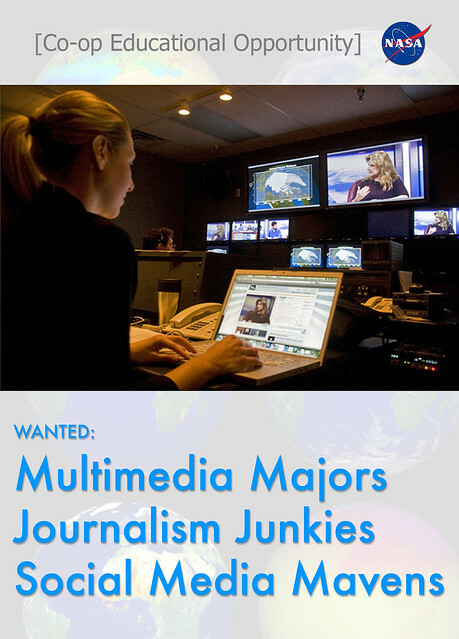 Experience in newsroom, web, video and multimedia environments desired. We are especially interested in students who are able participate in the program for a minimum of a year. You may work on an alternating semester or quarterly basis and are expected to spend a minimum of three semesters/quarters on the job prior to graduation. This can include a summer tour. You are expected to meet the same employment standards as permanent employees. Applicants must be US citizens and have a strong academic record. NASA Goddard Co-Op Program: This unique program is designed to give promising undergraduate students the opportunity to gain practical experience complimenting their academic studies. You’ll be provided with challenging assignments that are aligned with your academic studies and personal interests. We seek highly motivated undergraduates in variety of fields including journalism, science writing, multimedia production, and corporate communications. Graduate Studies: Our graduate studies Co-Op program looks for highly motivated students. Students selected for this program should be entering either their first or second year of graduate studies following this assignment. Apply: Send a resume and cover letter to Goddard Multimedia [goddard.multimedia@yahoo.com]. Please include the position title “NASA Co-Op” in the email header. Deadline: Available immediately. Apply now! Increase national and regional media exposure for Bedbugcentral.com and to a lesser degree Cooper Pest Solutions. The position will evolve as Cooper and BedBug Central media attention adapts and as product lines change. The PR Account Executive will lead and execute all media relations and event logistics coordination on behalf of BedBug Central. The PR Account Executive will work very closely with the e-commerce director and the two positions will coordinate activities. Additionally, the PR Account Executive will also have the opportunity to help management build and lead a new agency within Cooper Pest Solutions. Brand Resources Group (BRG) is currently seeking a high-energy Account Director to support its growing safety, health and wellness business. Our roster includes a mix of pharmaceutical, medical device, non-profits, advocacy, food/nutrition, health insurance and medical/physician societies. Whether we're promoting pathways to a better quality of life or driving a preventive action that ultimately saves lives, BRG campaigns span the spectrum of safety, health and wellness, consistently applying all the communications tools that make a message resonate. Position with 10-year old boutique PR firm located in Google Building near Dulles. Ideal for person with flexible schedule. May lead to full-time position in Fall, 2011. Requires minimum 7 years experience with some PR Agency preferred. Run accounts including large corporate PR; multi-faceted in energy, education, technology. Also requires tactical delivery of media relations placements (solid contacts in tier one business press), event management, op-ed writing, and social media PR including SM Video Production work. College degree in journalism, communications or PR required. Salary negotiable/competitive with PRSA Standards. Hours flex. but some time in office is necessary for status, client calls. Check out http://hoojobs.com for public relations, communications, and social media job listings! Please post the following position to your website. Please let me know if you need anything else. Thank you. What's your passion? Maybe you want to run with the team at Saucony or make a difference in children's lives around the world at Stride Rite. Maybe you're looking to share your passion for the sea with associates at Sperry or you want to make fashion-forward footwear accessible to all at Payless ShoeSource. Or maybe you want to build on the heritage of an iconic brand like Keds. As a leader in bringing compelling fashion, performance and lifestyle brands for footwear and related accessories to consumers worldwide, Collective Brands, through our three business units, Payless ShoeSource, Performance + Lifestyle Group and Collective Licensing International, is one of the most progressive and innovative retail, wholesale, licensing and ecommerce organizations on the planet. Style. Passion. Innovation. Performance. Together we are Collectively Stronger. Our world headquarters is centrally located in Topeka, KS, facilitating easy travel to all parts of the country. And, Topeka enjoys close proximity to Kansas City and Lawrence, home of the University of Kansas, providing our Associates with multiple communities in which to reside. The person in this role will be responsible for helping to plan, develop and execute communication plans, employing existing and new channels to communicate key messages, monitoring communities for both employee insights, and helping to drive change across the organization. The ideal candidate must be a strong writer and editor and have a track record of success working with a wide variety of writing styles, communication vehicles, including intranet, PowerPoint and marketing publications. This individual must be results-driven and comfortable working with employees at all levels. This highly visible role requires outstanding interpersonal skills and the ability to work in a fast paced and deadline-driven environment. This role will deliver critical communications across several Organizational Change Management projects specifically focused on systems and process improvements to CBI associates and suppliers throughout the U.S., Europe, Canada, PR and Latin America. Organization and flexibility are key; creativity, drive for results and high-energy, “roll-up-your-sleeves” positive attitude and commitment to hard work and success are imperative. – Write, edit, and send messages to all CBI Executives, Stakeholders, Project Team Members, CBI Associates and outside vendors including but not limited to emails, newsletters, articles, scripts, etc. – Detail oriented, planner with strong communication skills; including both written and verbal. of a broad range of internal communications and mediums targeted to Payless associates throughout the U.S., Canada, Puerto Rico and Latin America. – Manage the daily demand of communications sent via Actions and Announcements store messaging system. Develop clear, concise, and accurate communications in order to support Store Associate's efforts to deliver superior service and operational excellence to our Customers. – Write, edit, and send messages for distribution to Stores, including but not limited to e-mails, newsletters, articles, scripts, etc. – Actively contribute to the content and development of monthly articles and publications (e.g. “The Source”, Payless Central intranet content, etc.). – Achieve 80% or greater on planned messages metric. – Maintain a personal message error rate of less than 5%. – Collaborate with primary clients, Human Resources, Loss Prevention, Central America/South America and Retail Operations to develop communication strategies, plans/schedules, and formats to ensure all messages conveyed to Stores are supportive of the Company's operational strategy. – Partner with internal departments/ groups at Corporate to advocate communication planning. – Ensure the communications group is included in the scope, vision and planning of new initiatives impacting Payless retail. – Identifying the target audiences/take into consideration the perspective of the Store Associates. – Determining the most effective communication vehicle(s), including but not limited to, e-mails, downloads, intranet, newsletters, articles, scripts, surveys, posters, job aids, product knowledge collateral, brand books, Look Books,etc. – Determining timing, sequence of events and follow up through project planning. – Identifying the project team, risk factors that could affect the quality and timeliness of the communication and, if necessary, developing a budget. – Negotiating with partners to agree open on deliverables and distribution methods and securing necessary approvals. – Manage translation vendors and translations budget. This role is critical to leverage the data warehoused on the Announcements and Actions communication tool. – Manage the daily changes required to the communications message calendar. – Utilize calendar data to update communication metrics, specifically tracking the number of planned messages and error rate of store communications. – Lead all communication analytic projects related to Announcements and Actions communication platform. – Identify trends, issues and opportunities through the analytics package made available through the Announcements and Actions system. – Creative ability to create and execute clear, concise and accurate communications in a fast paced, deadline-driven environment. – A minimum of two (2) years of retail management experience at Payless or similar specialty retailer. – Bachelor's degree is required, preferred degree in communications, journalism, marketing or business. Master's degree a plus. – Detail oriented, planner with strong communication skills; especially written. – Ability to read, create and interpret Excel based reports. – Ability to work independently with minimal supervision. – Strong analytical skills- ability to understand and summarize large amounts of data and identify trends and recommend solutions. – Strong problem solving, conflict resolution and consensus building skills. – Project management experience required- Ability to lead projects and initiatives. – Proficiency with desktop/electronic publishing software Word, Power Point and Excel. – Prior experience editing and publishing a daily or regularly scheduled internal communications vehicle e.g. newsletter, web-page, intranet, message portal, periodical, etc. – Proficiency with design and graphics software, particularly In-Design and Adobe Photoshop. reporting to corresponding Division Presidents. marketing and communications support for assigned ACE businesses. communications, financial and executive communications. strategies, events, etc., in consultation with senior business leaders. you don’t enjoy pitching, don’t respond). in Pennsylvania, New Jersey and Delaware. placement of strategic news about PHS in collaboration with PHS staff. excellent judgment and tactical planning. – Bachelors Degree in communications or 3-5 years in related field. those chosen for an interview will be contacted. opportunity to work in the booming animal health market. (and have fun doing it) in our bright, modern offices. media, direct response and brand advertising, is highly desired. – A sense of humor is non-negotiable. – Pet lover a must! 401K, vacation allowance and, of course, pet insurance. 29.08.2011: 0655 UTC: Posn: 12:30.25N – 043:52.37E, Gulf of Aden. Five pirates armed with guns in two skiffs approached a chemical tanker underway. Master raised alarm, gave one long blast and crew mustered at a safe place. When the skiffs came close to 15 metres from the tanker, the onboard security team fired warning shots resulting in the pirates aborting the attack. 324-11 27.08.2011: 0600 LT: Posn: 01:27.6S – 116:48.6E, Lawe-Lawe Anchorage, Balikpapan, Indonesia. About 6-7 robbers armed with long knives in a motor boat approached and boarded an anchored tanker. They took hostage the duty watchman and tied him up. The robbers stole ship's stores and properties and escaped. The Master made several attempts to contact the port and harbour authorities and PFSO by VHF but received no response. 323-11 24.08.2011: 0550 UTC: Posn: 14:36.4N – 042:21.9E, Around 35nm WxS of Al Hudaydah. Southern Red Sea. 322-11 22.08.2011: 0330 – 0630 UTC: Posn: 04:45.0S – 011:45.7E: Pointe Noire anchorage, Congo. Robbers boarded an anchored container ship, stole ship properties and escaped unnoticed by the crew. 321-11 23.08.2011: 0541 UTC: Posn: 13:08N – 049:11E, Gulf of Aden. Five armed pirates in a white coloured skiff chased and fired upon a container ship underway. Master raised alarm, increased speed, took evasive manoeuvres and contacted warship for assistance. Pirates aborted after chasing the ship for 20 minutes. S8-11 Please Note this incident will not be included in the IMB statistics. 22.08.2011: 0900 UTC: Posn: 05:21.2N – 001:55.6E, Around 60nm SE of Lome, Togo. A white coloured suspicious fishing boat was noticed to be slowly closing on to a drifting container ship. The ship started her engine and moved away from the boat. The suspicious boat tried to follow the ship but later stopped as the ships speed increased. The description of the boat was similar to the one reported by a drifting tanker. The tanker had reported around 30 uniformed persons with machine guns in the boat. 320-11 19.08.2011: 0155 LT: Esmeraldas Anchorage, Ecuador. Duty watchman onboard an anchored chemical tanker noticed three robbers on the forecastle deck. One of the robbers shouted at the watchman and threatened him with a long knife. The watchman ran away and informed the D/O on the bridge who raised the alarm. Seeing the crew alerness the robbers escaped with ship stores. Port authorities informed. 319-11 21.08.2011: 1454 UTC: Posn: 16:09N – 053:36E, around 55nm SSW of Salalah, Gulf of Aden. Pirates in a skiff chased and fired upon a chemical tanker underway. Master raised alarm, increased speed and took evasive manoeuvres. The pirates made several attempts to board the tanker and finally aborted the attack due to the evasive manoeuvres made by the tanker. A mother vessel was sighted in the vicinity. 318-11 20.08.2011: 2325 UTC: Posn: 05:38N – 002:39E, Off Cotonou, Benin. Twelve pirates armed with guns boarded a chemical tanker involved in STS operations. The pirates took control of the ship and sailed to an unknown location. Owners unable to contact the vessel. Further details awaited. 317-11 20.08.2011: 0108 UTC: Posn: 16:54N – 054:03E, Salalah Anchorage, Oman. Armed pirates attacked and boarded a chemical tanker at anchor. They took hostage 21 crewmembers and hijacked the tanker to Somalia. *** Hockey shirt of the week: Boston Bruins – signed by Phil Esposito, Ken Hodge, Wayne Cashman, Terry O’Reilly and Carol Vadnais. another. The JOTW serves 11,511 professional communicators. You can reach thousands of communication professions with the Job of the Week newsletter and www.nedsjotw.com. Contact Ned at lundquist989@cs.com and reach out today!